Typing injury, a form of Repetitive Stress Injury (RSI), has become a common problem as people spend longer and longer hours on their computers at work, on the Internet, and for gaming. Part of the reason is the poor ergonomic design of many computer keyboards. 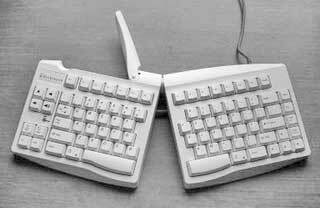 Physical damage from typing tends to creep up on you, starting as minor discomfort that barely registers. However, if you keep doing the things that cause injury, the problem will worsen. Tendinitis can develop. Muscles in the hands and arms may become irritated as well, a condition called myositis. As soft tissues become more inflamed and swollen, they can press on adjacent nerves, causing tingling, pain, and weakness in the fingers, and diminished motor control. Carpal Tunnel Syndrome in the wrist is a frequent complication of typing injury. Sometimes scar tissue will develop. The cumulative effect of all this can become permanently crippling. I suffer from typing pain myself, partly due to a more general problem with polyneuritis related to fibromyalgia. Some keyboards will have me in severe pain (enough that I can't continue typing) in less than ten minutes. Half an hour typing on other keyboards leaves me in pain for hours, from my fingertips to my elbows. However, some keyboards allow me to work all day (taking breaks, of course) without excessive discomfort. The difference appears to be keyboard design. Why do conventional keyboards have such a monstrously long key-travel and stiff key springs? My own first symptoms of computer-related typing pain came from using an old Mac Plus keyboard, which began to leave my hands so numb that I couldn't grip a pen properly after a half-hour of typing. The Mac Plus keyboard has a very hard stroke landing. Newer keyboards with a lighter touch and more flexibility seem to be less of a problem. My favorite computer keyboard is the built-in one on the PowerBook G3 Series WallStreet. The beauty of the G3 Series keyboard is that the key travel is about 1/8", and the touch is both feather-light and silky-smooth. It's the keyboard by which I measure all others. The WallStreet's keyboard incorporates most of the characteristics I find comfortable in a keyboard: a flat plane, feather light touch, smooth action, short travel, and soft landing. I don't know whether the G3 Series keyboard's flexibility (which some people don't like) was intended to address the ergonomics issue or not, but I think it's a significant part of the reason why these PowerBooks are so easy on the hands. 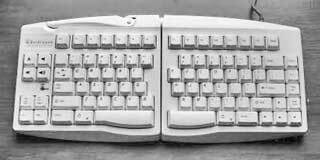 However, I don't have Carpal Tunnel Syndrome, and some users who do find that split, splayed, arched, or otherwise modified keyboards are more comfortable for them than the standard flat computer keyboard. An advanced approach to positive keyboard ergonomics is adjustable planes. 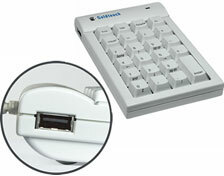 An adjustable-plane keyboard recently introduced for the Mac is the Key Ovation Goldtouch Apple Compatible Keyboard. Key Ovation argues that "if it isn't adjustable, it isn't ergonomic." I don't entirely agree, but there's no disputing that individual computer users have a variety of anatomies and physiologies, and keyboard adjustment capability makes it possible to more precisely accommodate these idiosyncrasies. 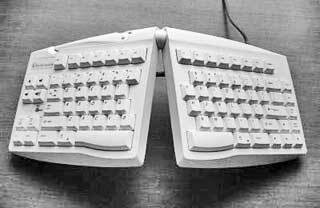 The ergonomic advantages of adjustable keyboards are also backed up by scientific research. In a blind study by VSI Risk Management & Ergonomics, an ergonomics firm located in Newark, California, of 20 government employees who began using the Goldtouch keyboard instead of standard flat keyboards in their office setting, all users, with the exception of one, instinctively figured out how to position the Goldtouch board to fit their comfort level without instruction or explanation. Neutral hand postures were obtained with 19 of the 20 users without explanation of how to avoid awkward wrist postures (ulnar and radial deviation) with keying providing support for innate keyboard design. The Goldtouch Apple Compatible Adjustable Keyboard is claimed to be the first fully adjustable ergonomic keyboard for Macintosh users, and I can't think of any other 'board in this category that has ever specifically supported the Mac (although makers of other ergonomic keyboard solutions - say the Kinesis folks - will doubtless dispute Key Ovation's assertion that "if it isn't adjustable, it isn't ergonomic"). However, the Goldtouch keyboard's signature feature is its adjustability. The Adjustable Ergonomic Keyboard allows you to configure its two split alphanumeric sections both horizontally and vertically to suit your individual body requirements. Placing your hands flat on the keys of a keyboard can require considerable muscular effort, which in turn can cause fatigue and discomfort. The Goldtouch keyboard's two segments can be raised in the center to more closely match the natural alignment of the forearm and wrist. Forcing your hands down to the keyboard is a hand movement known as pronation. This is the rotation of the right hand in a counterclockwise direction and clockwise for the left. The theory is that this helps you assume a more natural posture conducive to relieving unnatural stress on your arms and wrists, thus improving comfort and productivity while using your computer. For example, if you orient the Goldtouch's halves in an inverted-V "vertical tenting" configuration with the near sides splayed, your hands and wrists can assume natural pronation body-English that doesn't stress joints and tendons - or the carpal tunnel. Adjustment within the 0°-30° range provided in both planes is infinite, quick, and easy to change. You can, of course, also use the Goldtouch keyboard in a conventional flat orientation. You probably wouldn't want to pay the premium price for this sort of use exclusively, but it's very convenient if more than one person uses the computer and other users are not accustomed to or comfortable with typing on a split and angled 'board. Configuration of the 'board's "back to flat" mode is simple and virtually instant. Just flip out the large locking "over-center" lever at the top of the 'board, orient the halves to the desired angles, and flip the lever back home to lock the configuration in place via the ball and socket latch mechanism. Wraparound soft rubber-like contact pads provide traction and protection for the support surface with the keypads set at any angle. The "vertical tenting" configuration certainly does position your hands and wrists in a more relaxed orientation and should without question result in less stress on muscles, tendons, and those troublesome nerve tunnel sheaths in your wrists. This mode is, of course, more practical for touch typists - if you're of the hunt-and-peck school, like I am, it does make it more difficult to watch the keys. On the other hand, adjusting to that and/or learning to touch-type could be preferable to living with sore arms and wrists. The Goldtouch Apple Compatible Keyboard has a standard QWERTY layout for the main keys, but it's a bit unorthodox in other aspects. There is no numeric keypad, which helps keep the keyboard footprint relatively compact at about 18" wide (fully expanded) and 7" deep. More on this in a moment. The keys are labeled with Apple symbol conventions, but with a slightly different configuration from usual in some instances. Because of the split feature, there are two space bars, flanked on both sides by Command and Option keys, but the Control key is at the far left of the bottom row, outboard of a Help key that is not very helpful in that position, IMHO. An eight-key pad on the extreme right includes the latter two keys plus a Power key, a Num Lock key, a Mute key, two audio volume keys, and a CD/DVD eject key, and well as Caps Lock and Num Lock warning LEDs. On the opposite end of the 'board, there are Home, End, Page Up, and Page Down keys arranged vertically outboard of the main keypad, and inverted-T navigation keys where you would expect them to be. At the top, there are thirteen F-keys (a bonus of one over what you get with laptop keyboards), and an extra Delete key. In terms of keyboard function and feel, the Goldtouch Apple Compatible Keyboard's key action is pleasantly light and smooth, with a soft (but not flexible) landing. The key travel is longer than I prefer, but a bit shorter than on many conventional keyboards. The keys, which I assume from their feel are high-quality membrane type, are reasonably quiet, although not as quiet as a PowerBook or MacBook Pro keyboard. There is audible clicking as the keys are depressed, but no IBM or Apple Extended Keyboard II sort of clatter. 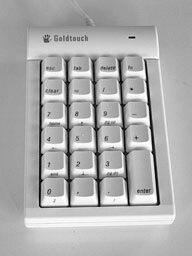 As noted above, this Goldtouch keyboard has no numeric keypad, an omission that helps keep the keyboard footprint relatively compact - and which I don't personally find a major inconvenience, being used to working on laptop keyboards, but users who work with spreadsheets would. Happily, an optional, freestanding numeric keypad is available, and one of these units was included with the corrected test keyboard. The Apple Compatible Numeric Keypad Hub was created specifically to bundle with the Apple Compatible Adjustable Keyboard, which it matches in style and quality. Because it's a freestanding module separate from the main keyboard, the Numeric Keypad can be placed where it's most comfortable for the individual user and provides desirable flexibility in periodically changing arm, hand, and shoulder position. One thing I don't like about the Goldtouch Numeric Keypad is really a criticism of the Apple Compatible Adjustable Keyboard, which has no USB repeater ports, so one is obliged to use up another precious port in one's USB hub to plug in keypad. I'm not singling out Goldtouch on this point. More and more keyboards these days are being designed without USB repeater ports. I expect it has something to do with cost and the assumption that most users have USB hubs. I do, but the port array is always filled up, and I end up routinely unplugging devices to accommodate other peripherals. Happily, the Numeric Keypad Hub has two USB repeater ports that support low voltage devices such as a mouse - but unfortunately it doesn't support having the keyboard plugged into it, so you're still going to use up two USB ports for the keyboard and keypad. If you have typing pain issues and split/angled-orientation keypads seem like a promising solution for you, the Goldtouch Apple Compatible Keyboard may well be your ideal choice - and to my knowledge this is the only such product available with a native Apple key layout and labeling. The Goldtouch Apple Compatible Keyboard seems solidly constructed with a high standard of finish, and is surprisingly heavy in the context of today's keyboards, no doubt due substantially to the adjustment mechanism, which seems very robust. The Goldtouch Apple Compatible Keyboard sells for $139. The Apple Compatible Numeric Keypad Hub sells separately for $49.95. The Apple Compatible Keyboard and Numeric Keypad Hub Bundle is $179.95. Small, space saving footprint to bring your mouse inside your ergonomic "comfort zone"
2 USB Ports allow users maximum versatility to plug your mouse or other low voltage devices into the keypad, for a more organized workspace.